Branson Landing land titles: how soon we forget how it was just 10 years ago! Pictures help to tell the story that lies underneath the disputed land titles at the north end of Branson Landing. You can click on these images to enlarge them. Here’s the 1913 plat of Park Addition to the City of Branson. The southwest corner of the Belk building sits about where Sycamore Street joins what has been called St. Limas Street and Boxcar Willie Drive, now Branson Landing Boulevard. 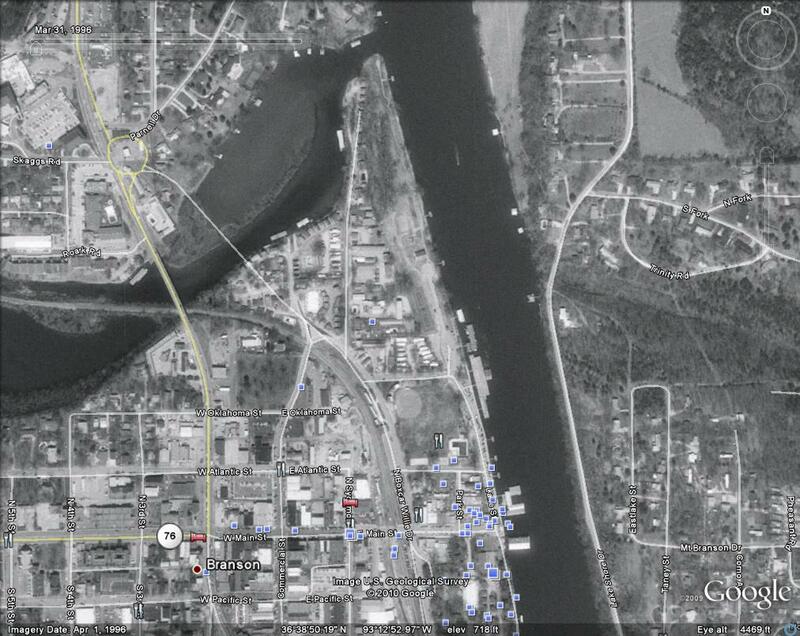 The platted lots in Block 4 of Park Addition were the location of resorts until construction of Branson Landing began. Mang Park, with a baseball diamond and swimming pool, occupied Block 3 of Park Addition. Oklahoma Street (not shown on the plat but on the image below) ran along the north side of Mang Park. The Melody Lane Resort and the Rainbow mobile home park fronted Oklahoma street. Several more resorts–Arrowhead, Vacation Place, and Wild Bird come to mind–were along both sides of Sycamore Street, extending to the Sharp’s Resort adjacent to the Business 65 bridge. What were some of the others? The lots in Block 4 and Block 5 were purchased by the City of Branson from the various resort owners as the land for Branson Landing was assembled in 2001 and 2002. Many of those resorts had been in operation since the 1920s or even earlier. The Belk store and parking lot north of the Belk store and Branson Landing Boulevard are on what was once Blocks 4 and 5 of the Park Addition. West of Block 4, you see the words “Ozark Power & Water Co.,” referring to Empire District Electric Company’s predecessor. This narrow strip of land included Lake Street and the old tennis courts, which you can see on the Google Earth map below. 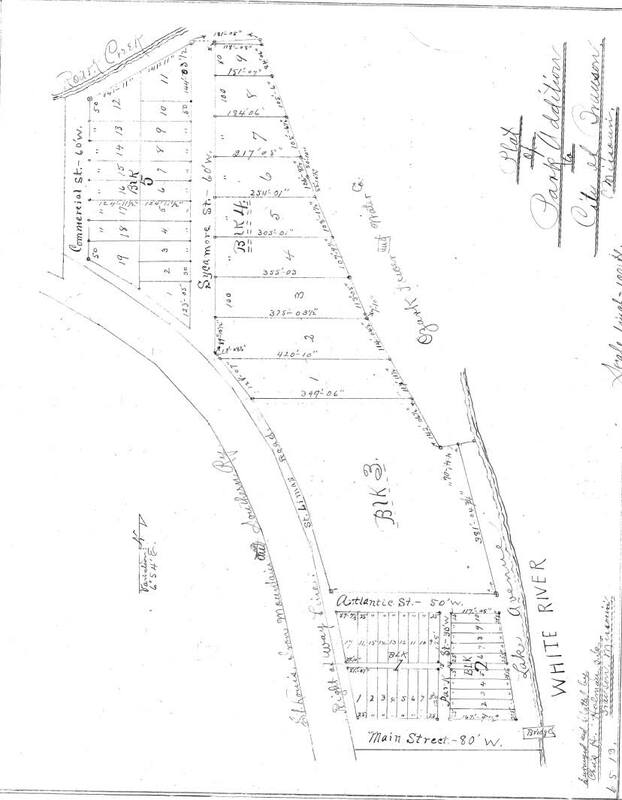 In the lawsuit discussed here in yesterday’s post, the judgment contained legal descriptions from old deeds, affirming that Doug Coverdell and Coverdell Enterprises had better title than Empire District Electric Company to a wide swath of land, including these lots in Block 4 of Park Addition, which the City of Branson purchased from longtime owners. While Coverdell and Coverdell Enterprises may have better title than Empire to these lots–which Empire may have never claimed–the court did not explicitly determine that Coverdell and Coverdell Enterprises had better title than the City of Branson to the lots in Block 4 and Block 5 purchased from resort owners. Posted in adverse possession, Branson, Branson-Missouri, economic development, Missouri law, Ozarks economy, real estate development, real estate law, Taney County, tourism and tagged Branson Landing, Coverdell, Empire District Electric Company. Bookmark the permalink.